My wife Lauren and I arrived on the southwest Pacific side of Costa Rica about 6 days ago. So far it's been an adventure (and lot of fun!) reacquainting ourselves with this rural Costa Rican community. Lauren and I have really grown fond of the people here, as well as the environment, and of course the fishing! Monster pacific black snook, roosterfish, needlefish and jacks inhabit this section of coastline, but acording to the locals, catching a cubera snapper in the surf here is a very rare event. However, at around 7:00am this past Monday morning, I got super lucky. My popper was tumbling down the face of an incoming wave when I gave the popper one last "pop!" 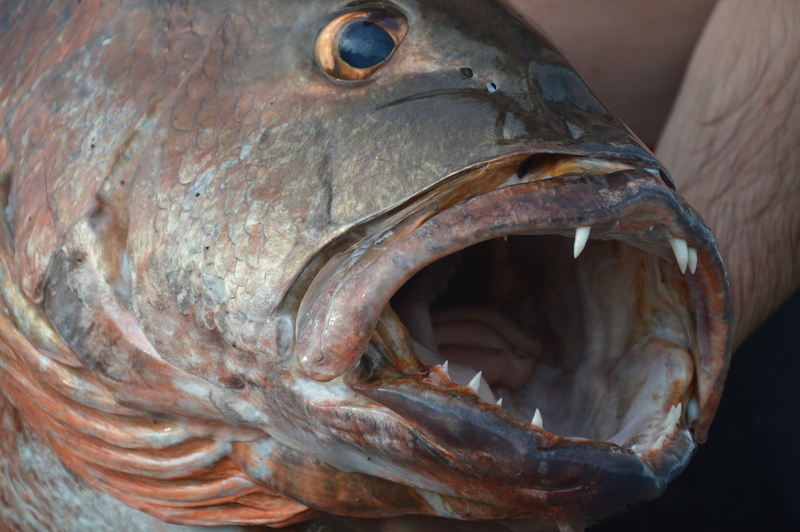 The popper was now about 10 feet from my rod tip, and I was just thinking about making another cast when the rare and powerful cubera snapper burst through the wave and hammered the lure. 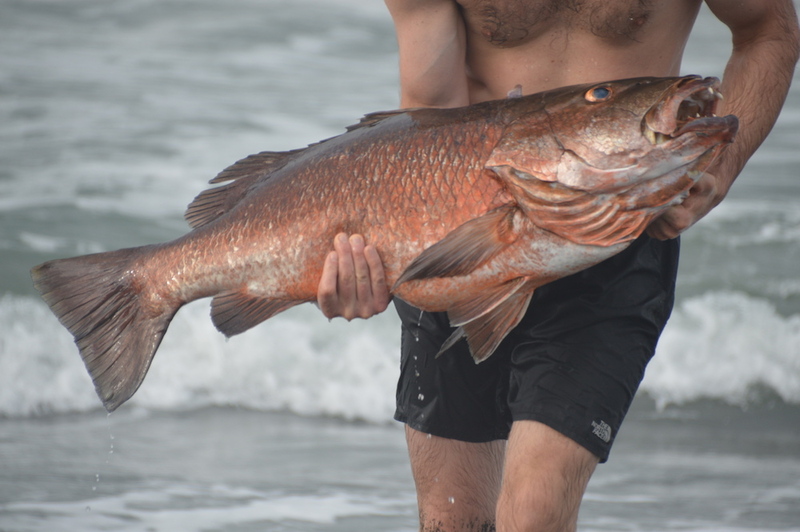 Cubera snapper are a sought after food fish in the area of the world. The meat is white and has the same texture as chicken. Needless to say we have been eating great the past few nights! The lure I used to catch this snapper was this Tactical Angler Bomb Popper from Canal Bait & Tackle in Sagamore. The fish was caught using a Van Staal VR150 reel from the Goose Hummock in Orleans. You just never know what might bite next here in Costa Rica! Special thanks to my awesome wife Lauren of @lblackerphotography for snapping these terrific photos of the snapper. Yesterday and today I have seen several large fish of an unidentified species swirling behind my plug. I also saw what I believe was a huge snook crashing sardines against the beach. Right now it's late on Wednesday night, but I wanted to make sure I published this post to let you know what is going on. Be sure to check back tomorrow and later this weekend for more updates. Came across this video trying to research CR surf fishing, awesome catch. I think I’m finally going to make a trip out there next year. What’s the best area to stay to be close to this kind of fishing? Thanks! Hey Ryan! Great catch! I watched your videos on YouTube. My 12 year old son and I caught a 50 pound Cubera 2 years ago in Tamarindo as well as a Jack Crevalle and a Spanish mackerel. All from a kayak! It was awesome. I will be staying in Jaco in August for a week and will totally be adding that white popper to my arsenal. My wife and I are always looking for new places to visit in Costa Rica. Would love to check out your “resort”. Would you be willing to share any of the details. A 50 pounder from the kayak, WOW! That must of been wild. I will send you an email right now about the Arena Alta Wildlife Community, which is the eco-community that my friend is developing. 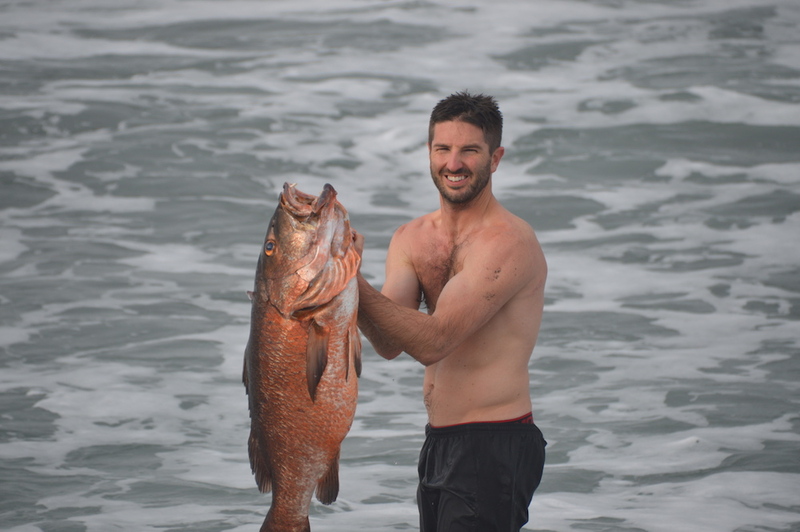 Looking for the best surf fishing spot in Costa Rica. Mostly for eating fish for myself and those staying where I am. And maybe the odd prize fish to test my skills. Please let me know where I should be going. I will stay in that area for my whole trip from Dec to April. I’ll be wanting to volunteer in the community for a few hours each day. Being a contractor in many areas. If your friends eco community is rolling. I am interested. You certainly put that gear to the test, Ryan. Great Vid and a great beast of a fish. The cuberas pull incredibly hard and are super powerful. Amazing fish Ryan! We are thinking about going back to Costa Rica hopefully next year. Our first trip was all about the monkeys! Now, no matter where we go on vacation fishing will definately be apart of it. I think you would enjoy fishing here very much Jeanne. There are monkeys, and there are big fish. How can you possibly beat that combination!? What kind of camera are you using? GoPro? Ever tried any of the knockoffs? I’m using the GoPro Hero 4, and no I have not tried any of the knock-offs, but if you have a recommendation I am all ears. I just bought a cheapy Akaso Brave 4k, strictly for personal use. I’ll start using in in Mexico in Jan, will report back. The sole reason I opted for this was the cost, but you have different priorities! Wow, Ryan! I mean fantastic, dude! That’s a real feat from shore. I had one chase my gibbs pencil off the rocks down there once, but no hookup. Where in CR are you? Still must of been exciting to see a big cuberra following that pencil! I am currently in the Golfo Dulce, which is in the southwest part of Costa Rica. Looking Good there Ryan ! Always did love fishing the Pacific Coast of MX will have to try CR. Nice Jim! Maybe I will try the pacific coast of MX someday. CR is a fantastic place, especially in the rural region of the southwest part of the country. What a great looking fish. It sure beats the snappers I’ve caught off of the Florida coast. Tastes a lot better than rooster fish, too! 🙂 I hope you and Lauren are enjoying your return to Costa Rica. Good to hear from you Gene! You are correct that this cubera tasted much better than the roosterfish. I caught a jack crevalle this morning which we are going to try for lunch. We’ll see how that goes! Fantastic Ryan! Have a bkast! Thanks for following along Leslie! lol, no problem at all, happy to do 5X the trek if that’s what it takes to make a cool video! 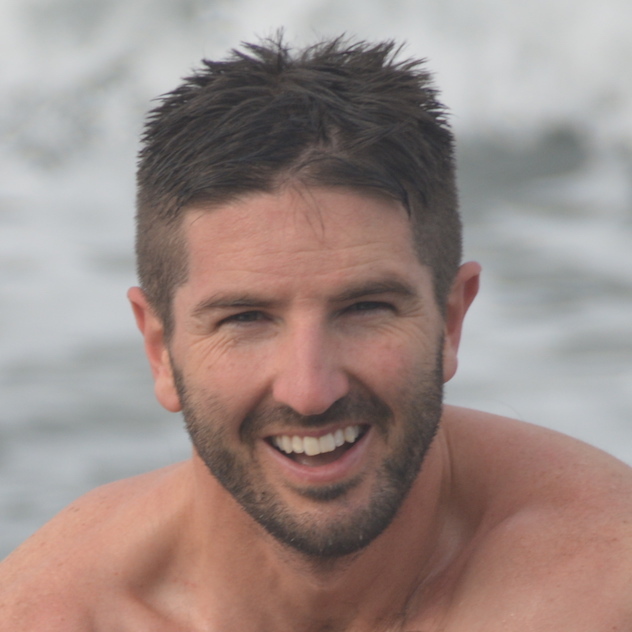 Pumped to have you following along via the blog Dave! Tight lines my friend. Thanks for watching James. I hope all is well and tight lines to you too! Lauren showed me the comment you left on http://myfishingcostarica.com/a-layover-in-san-jose/ Sounds like you and your wife are quite the adventurers! I’ll send you an email today with some more details about our trip. It’d be cool to run into you if our paths cross. Wow, How great… Catch a bunch more! Those snappers are elusive, but I will be trying every sunrise/sunset! Incredible fish! Super powerful fighter. Yes the teeth on those cuberas are intense! Good to hear from you Lee. Are you back in Las Vegas? PS – that was a fun night this past summer despite the “lockjaw bass.” Hopefully we can give it another go during 2018. Keep feeding the village. What a cool place and great fish. Will join you next year. We had a dinner for 7 adults and 3 kids, and we still have more than 50% of the fillets leftover. Would be fun to have you join us here in CR next year for sure. Wow, what a fish! 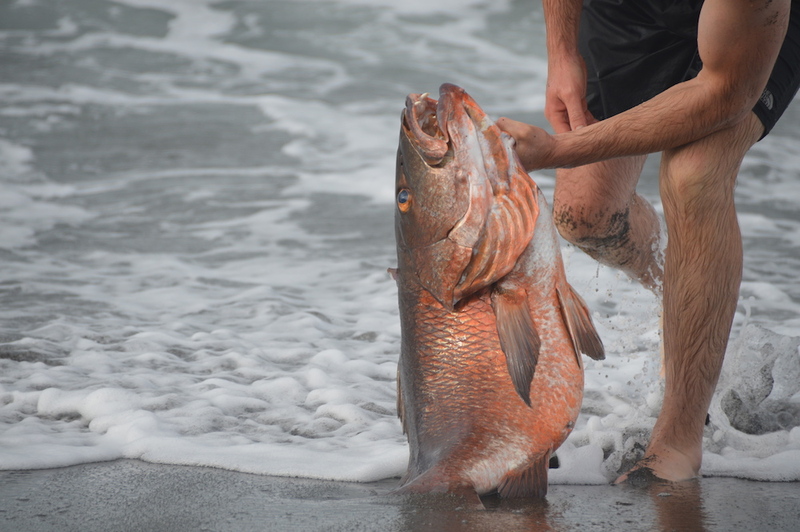 Is catching a Cubera snapper from the surf unusual? Enjoyed the video, but probably not as much as you and Lauren dining on this big boy. Are there other members of MFCC going to be joining you? 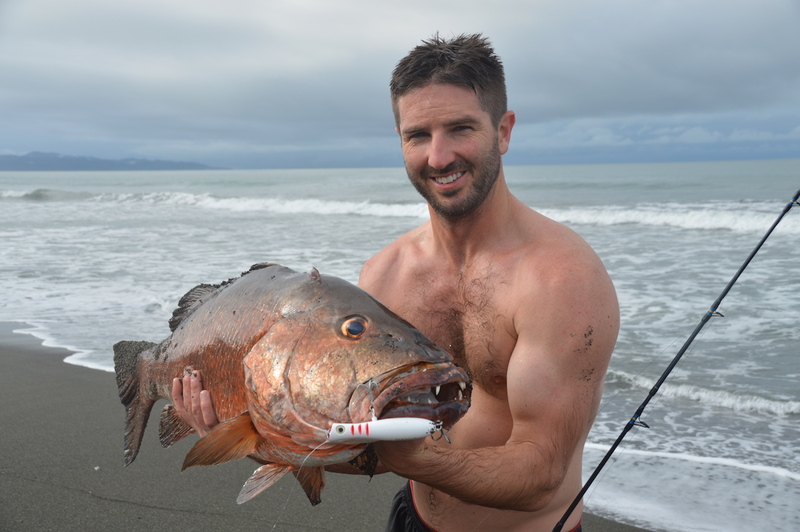 According to people who live here, catching a cubera from the surf is definitely unusual, but then again there are not many people who fish here using the plugs, tackle and equipment that I have at my disposal. We have 3 people from MFCC coming to join us for December 9-16. If somebody reading this wants to come, then let me know ASAP because there is one more available cabina right down the beach from us. Should be fun! Do you have a link for info and what’s the nearest airport? Lauren just emailed you information about the airport and the destination. Keep us posted if you plan on making the trek!